Nazareth Hospital provides an opportunity for West Bank physicians to spend a year or more of training at the Nazareth Hospital focusing on an area of specialization. Nazareth Hospital is able to accommodate two physicians per year in each of five areas of specialization: General surgery, Internal Medicine, Obstetrics/Gynecology, Orthopedic surgery and Radiology. 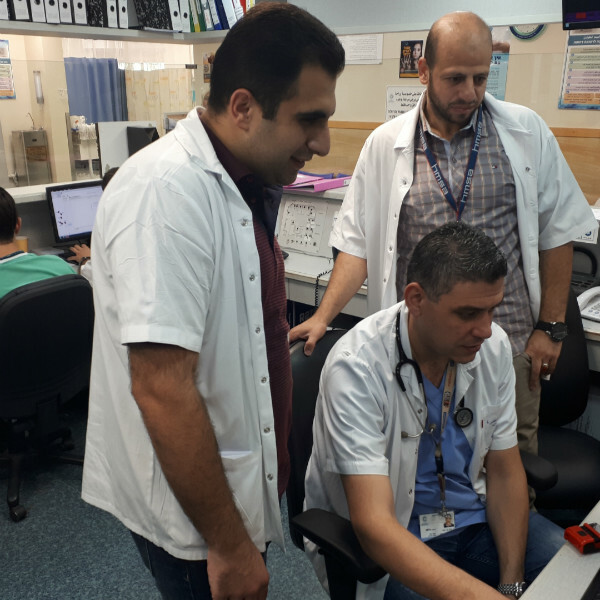 These physicians have completed medical training at a West Bank university or at a foreign medical school and are seeking further specialized training. The goal of the Fellowship Training program is to provide the Palestinian physicians with an opportunity to learn and advance in their knowledge in addition to preparing them to successfully pass the medical board exams of the Palestinian Authority. Some of these non-salaried physicians receive some support from a West Bank organization. NPI supporters are invited to contribute to a stipend fund for these physicians. Dr. Taher Salameh (left) , from Tulkarm on the West Bank, is a 27-year old graduate from Alquds Medical University. He started a residency program in internal medicine at Nazareth Hospital in February 2017. After completion of his residency at Nazareth Hospital, Taher plans to return to the West Bank and utilize his new skills to treat patients in medical centers there. Dr. Tamer Sbaih (top right) is specializing in orthopedic surgery as a resident at Nazareth Hospital. After studying medicine he worked as a Resident Doctor for the New Jericho Hospital and the Palestinian Red Crescent Society Hospital. After completing the residency, Dr. Tamer plans to be a proactive member in the medical field in Palestine and hopes to create a Medical Association of Orthopedics there.